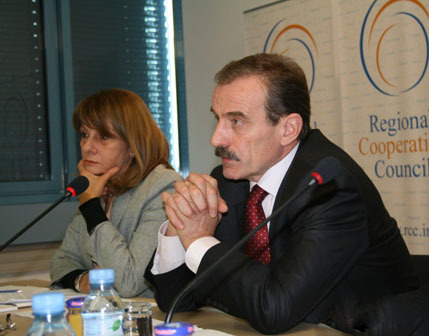 In the report, the RCC Secretary General outlined the activities of the Secretariat on the implementation of its 2008-2009 Strategic Work Programme in the priority areas of economic and social development, energy and infrastructure, justice and home affairs, security cooperation, building human capital, and parliamentary cooperation. He informed of completion of the RCC set up, a series of political consultations with high level officials from RCC members from Southeast Europe, cooperation with regional organizations and initiatives, as well as of the process of networking among RCC National Coordinators from Southeast Europe, RCC Secretariat, European Commission and relevant international financial institutions. Secretary General Biscevic announced upcoming RCC Secretariat’s plans, most notably the project of establishing the South East Europe Regional Fire-Fighting Centre and the Southeastern-Central Europe Catastrophe Risk Insurance Facility. He spoke of other activities and projects to be elaborated with relevant international partners, including promotion of sustainable use and integrated management of inland waterways. The regular quarterly report covers the period between 20 May 2008, when the Board last met, and 1 October 2008. It will be available at the RCC website www.rcc.int later today.